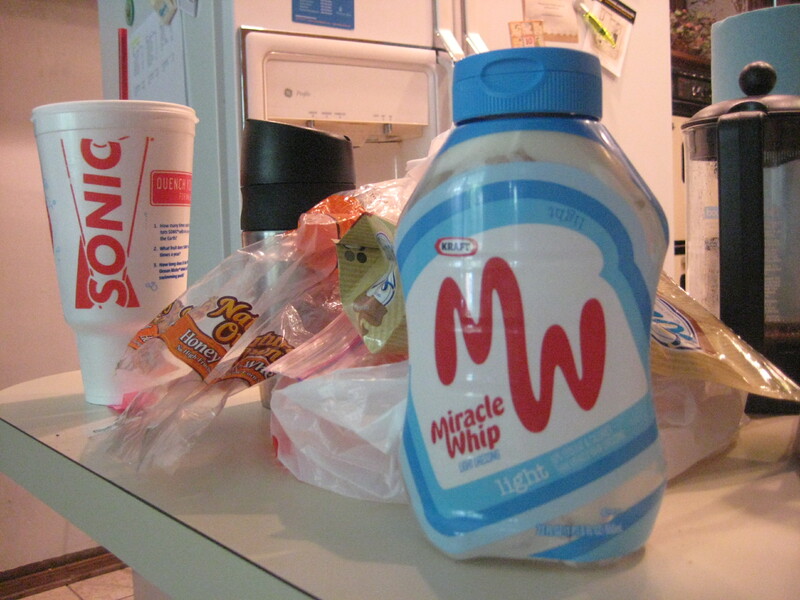 Miracle Whip, though no substitute for real mayonnaise, can be used in a pinch. Jell-O: Few things have captured the Midwestern imagination like Jell-O. Its mysterious jiggling qualities, its Biblical ability to suspend fruits, and its molded shapes that reminded German immigrants of their homeland, all contributed to Jell-O becoming the base of the ever popular Jell-O salad. My grandmother once told me that everyone in their old farming community had to have the latest Jell-O salad. It was a simpler time, when the space race between the Reds and the Uncle Sams was matched by a furious Jell-O race between Kansas homesteads. It was also a time that witnessed truly frightening innovation, which reached its pinnacle in the “Perfection Salad,” composed of lemon Jell-O, pimiento, celery, cabbage, vinegar, and sliced pineapple. Cool Whip: Cheers of joy were heard all across the Midwest when NASA revealed that its attempt at entering the hair product market had proven unsuccessful but that its creation, Cool Whip, was tasty and went great with gelatin. It quickly became the bosom buddy of almost every Jell-O salad. And thus Cool Whip made its way onto the dinner table, because Jell-O salads are not dessert. Mayonnaise: If one is unlucky and fresh vegetables must be prepared, mayonnaise is a sure solution to make them palatable. Considered the Cool Whip of non-Jell-O salads, it is a must in everything from the Kansas Broccoli Salad (3/4 c.) to the Kansas Cucumber Salad (1 c.). According to a scientific study, when Midwesterners view a salad bare of this white miracle condiment, they are 57% more likely to enter Mayo-rage. Few survive. Leafy Greens: Just kidding. The only truly acceptable version of a leafy green is cabbage, which can be turned into Mayo-slaw. Otherwise, all leafy greens are prohibited from joining the salad party and should be left in the garden as decoration. I’m from California… I had never heard of Miracle Whip until I moved to Chicago. The Hillbillies in Michigan and Indiana put it on their sandwiches instead of Mayonase… disgusting. Thanks a lot! I really appreciate it and I’ll do my best to keep on the ol keyboard. It’s funny, the timing of this article. My husband and I were at a restaurant yesterday (in the Midwest, of course) and he was truly disappointed that there was no Jell-O salad there. I thought he was kidding at first, but no, and now I know why. Thank you for helping me to understand my Midwestern-born husband a little better. Haha I’m glad to do my part about spreading cultural awareness. Cool Whip does stimulate hair growth but not on your head. Every where else but your head.Just soak in a tub full about an hour at a time for about a year and POW,hair all over your bod. Keep plenty of deodorizer on hand though,in case you start smelling like a giant armpit. Which for some animals is quite the appealing scent. I’m weeping now…..those first four ingredients were brutal. Oh, my goodness….I’m going to have to go for a run now now to cancel out the calories I just consumed watching this video. You forgot ketchup. What self respecting midwesterner makes salad dressing without combining mayo and ketchup. Luckily for me, I’m not self-respecting. Lol @ Cool Whip being NASA’s unsuccessful entry into the hair product market! 🙂 This is not only funny, but also on the edge of being believable. It was revealed to me in a dream, so it has to be true! You’d love the deli counter. They have salads swimming in mayo, slaws too numerous to mention and my pesonal fave rotiserre chicken salad made up from leftovers from the day before. Well you can’t just throw it away! Best to cover it in white goop and sell it. Gramdma used to whip up jello and fruit coctail and serve it in a cutesy mold. Ugg! I hated it but you have done her one better here. By the way did you get the pastel of Puppy in Hand? Mayonnaise! I write about mayonnaise as well! It’s been a great source of inspiration for me. This is where I have to disagree with the Midwestern mindset. Miracle Whip is no substitute. Ever. Ever. Ever. Also, my in-laws call mayonnaise “dressing.” I think that means something. Personally “cookies and cream salad” is my favorite. Available at all grocery store’s worth their cool whip. I agree with you but you won’t believe how many times I’ve seen it happen—as unhealthy as it is, if you’re going to use mayonnaise it’s better to go with the real stuff and just not eat a bucket of it.